Kim Stone’s talents are obvious, and the Golden State Warriors and their new upcoming home Chase Center recognized that as the venue management professional and Executive Vice President of Business Development for the Miami Heat and American Airlines Arena was named General Manager of the new facility in the Bay Area. Stone, whose profile story was shared in the March/April Facility Manager, brings her wealth of experience to the position in which she has direct oversight for all operations at the venue. Before being named EVP of Business Development last October, Stone served for 12 years as General Manager in Miami and led an arena that played host to four consecutive NBA Finals and was a top producer for concerts. This will mark her first move to the West Coast. 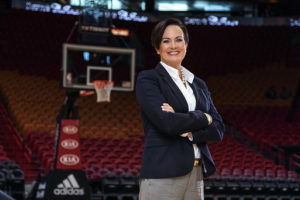 Stone has called Miami home for most of her professional career, save for two years when she served as Sports Publicity Director for the University of Texas women’s athletics department from 1992-94.